The first batch of 20 samples that were started in test last January have now reached the 40 Megalux-hour exposure mark. Assuming the often cited industry standard light level assumption of 450 Lux falling upon the prints for 12 hours per day, it would take 20 years on continuous display to reach this amount of exposure. I already see interesting trends in the data sets, notably in optical brightener activity loss and in color changes occurring to light skin tone and light gray patches that are higher than the average. These highlight values are not typically evaluated in commonly used industry light fade tests because they are lighter in overall density than the 0.6 and 1.0 density patches specified in those tests. See if you can spot the trends for yourself! That said, with the exception of the MIS R800 Ultrachrome Equivalent ink/paper combinations, the samples continue to hold up quite well so far. The severe loss of yellow colorant in samples AaI_20071008_SN007 and AaI_20071008_SN002 illustrates an important aspect of the role of yellow ink on print quality. The yellow ink channel is very important in establishing image color balance but it carries very little visual contrast. The I* color and I* tone scores reflect the nature of the yellow colorant loss. The I* color scores have dropped precipitously for these two samples whereas I* tone scores still indicate tonal retention above 90%. 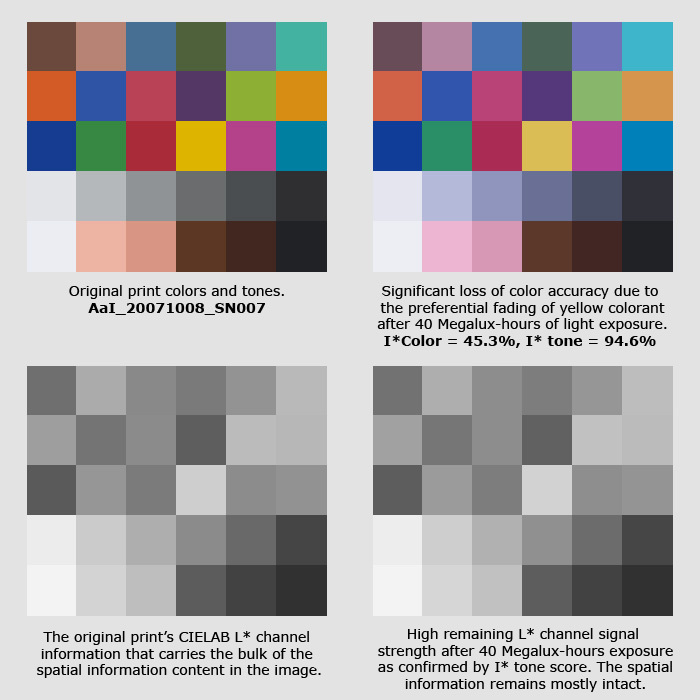 The following figure illustrates how color information content differs fundamentally from tonal information content. Although the preservation of the tonal information may be of small consolation to the printmaker or collector in the face of severe color errors, it is nevertheless an important attribute to the archivist and historian. Consider the case where a comparably faded print exists in the future on this ink/media combination and it becomes the only known record of an important historical event. The high tonal retention means that even if the color accuracy is poor, the spatial information documenting the original scene content persists. The faded color print can be scanned and electronically restored with high success rate because the I* tone score still remains high. Had the I* tone score been very low, the restoration process would be significantly more challenging, especially if local areas in the print had zero or negative I* tone scores.